When should I see my derm and when can I just go to the drugstore? I have patients in my office for all kinds of reasons. We all wear a lot of skin and there are thousands of problems with malfunctions and how skin looks. Spots, dots, wrinkles, rashes, zits… How do you decide what’s “dermatologist-visit-worthy” and what you can handle on your own? Rashes – those are always debatable but if they’re short term, limited to small areas and not accompanied by fever or blisters, you can probably quell them with an over the counter cortisone cream from the drugstore. Acne’s the one condition that be-devils most teens. Benzoyl peroxide to kill the acne “bug”, salicylic acid or glycolics to keep the pores unplugged. We love the new sonic cleansing brush called the Clarisonic – makes a clean sweep of makeup, the day’s dust and skin oils. Spots, dots and wrinkles – Sunscreen is your best defense. Hydration makes a difference so look for lotions and creams that are fragrance free. Acne that persists despite your best efforts. There’s no reason to suffer for years trying to wait it out. Rashes accompanied with blisters, fever or so intense nothing works. ANY rash accompanied by fever is potentially a bigger problem so see your primary doctor asap. White silvery patches are a sign of psoriasis. See a derm. Changing or new moles, sores that won’t heal, crusty spots that bleed. See a derm. 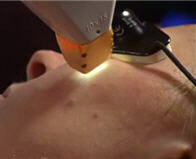 Discoloration, wrinkles, dark spots that bother you – there are prescription level products and wonderful laser and light technologies that do a fantastic fast job of blending and smoothing. If in doubt – Yep, you got it…See a derm!